In a major win for pipeline resisters, the Supreme Court of Canada has agreed to hear an appeal by the Chippewas of the Thames First Nations which threatens to shut down Enbridge’s Line 9B. It’s also a case with broad implications for several major pipeline projects currently under review, as well as for resource development on First Nations across (so-called) Canada. “First Nations and Métis partnership is at the very heart of the Northern Gateway Project,” claims energy giant Enbridge on their website promoting the pipeline project. These proclamations of mutually beneficial relations with First Nations and of the support of Aboriginal communities for the pipeline process are in many ways fantasies. Each of these projects faces widespread opposition from Indigenous peoples, both at the grassroots level and among many provincial and national leaders. This opposition has in many cases escalated to the extent of constructing blockades and protest camps to prevent pipeline construction. The consultation process of which these titans of industry are so proud has been widely condemned by First Nations across the country, with Aboriginal elders in Manitoba refusing to participate in NEB consultations over Enbridge’s Line 3 due to the absurd restrictions imposed on the process. To claim that the support of First Nations is “integral” to these companies’ success is therefore somewhat ridiculous on its face, as evidence of this support is in short supply. And yet, in another sense, these claims are absolutely true. These pipeline companies know that without at least the appearance of First Nations support, their chances of ever constructing these behemoth tar-sands tubes are slim. And so they quite reasonably do everything they can to play up the support they have received from some First Nations communities. The Liberal government’s release of new guidelines for the pipeline review process a few weeks ago was meant to end furious feuding over the future of Canada’s oil and gas sector. The National Energy Board (NEB) reforms came hot on the heels of a nasty debate over Energy East, as the rejection of the pipeline by Montreal-area mayors was absurdly spun as a threat to national unity. The reforms were also delivered in the context of continual pressure on the new government by activists frustrated with Trudeau & Co’s delays in following through on campaign promises to fix what was widely viewed as a broken process. But if the government expected their announced reforms to actually create trust in the NEB process or to do anything to cool down the overheated pipeline debate, they must be sorely disappointed. Two weeks later, it’s now clear that their proposed reforms have satisfied literally nobody, and the squabbling over pipeline proposals looks set to carry on indefinitely. [National Resources Minister Jim] Carr said the process will provide pipeline proponents greater certainty about the time involved in reaching decisions. “If we’re going to attract the investments we need to sustainably develop our energy resources, then we have to better engage Canadians, conduct deeper consultations with indigenous peoples and base decisions on science, facts and evidence,” Carr said. Pipelines are having a moment right now. Even in the darkest depths of the Harper years, I can’t recall a time when tar sands bitumen transportation infrastructure was such a hot-button headline issue. And not in an isolated one-off kind of way, either – barely a day goes by without some prominent national figure making some newsworthy statement about pipelines. 2016 is shaping up to be a year of major victories for pipeline resisters across (so-called) Canada. And once again, the latest major victory was made possible through the leadership of First Nations directly impacted by untrammelled resource extraction. In a serious blow to Enbridge’s Northern Gateway pipeline, the British Columbia Supreme Court ruled last week that the (so-called) province of B.C. abdicated its duty to consult First Nations when it signed an “equivalency agreement” with the federal government in 2010 which gave the National Energy Board (NEB) “equivalent” status and the authority to conduct these consultations on the province’s behalf. Analysts suggest that British Columbia is unlikely to appeal the ruling, given that the Supreme Court confirmed the existence of powers they most likely do not want to surrender. Avid pipeline watchers will no doubt recall the pair of high-profile direct actions against Enbridge’s Line 9 last month. On December 7, a pumping station near Ste-Justine-de-Newton, Quebec, was occupied and the valve allowed Line 9’s diluted bitumen to pass through was closed. 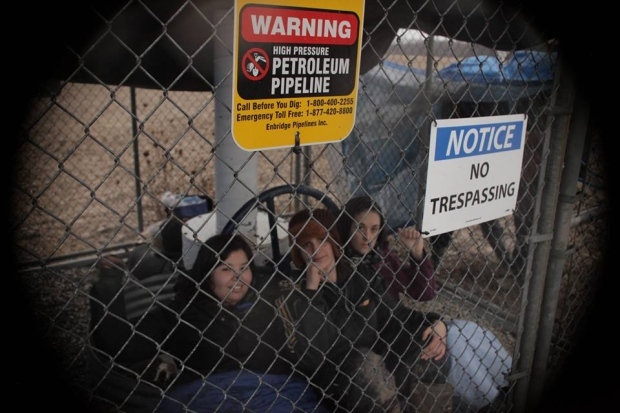 The badass activists conducting the action then locked themselves to the equipment, which resulted in the pipeline’s complete shutdown for an entire day.